Dental caries is the most commonly occurring disease condition among 291 conditions included in the 2010 Global Burden of Disease Study. Worldwide, 60%–90% of school children have dental caries. It is the leading chronic childhood disease throughout the world. Hence a need to address this rising burden is crucial. Since children spend a good number of hours in schools, oral screening, in a school setting, is one of the measures that may be used to ensure early detection and prompt treatment of dental caries. The World Health Organization recently supported screening of children for dental diseases and conditions in the school setting to help reduce costs of dental service provision and to support planning and provision of school oral health services. Dental screening in schools has been practiced in several countries over the past decades. The process involves visual examination of children in schools, identification of dental diseases and conditions, followed by apprising parents of those children who screen positive for both the disease condition and the treatment choices. Generally, dentists undertake school dental inspection and are responsible for the decision on referral of a child. The true objective of screening is the detection of disease at a point in its natural history when it is not yet symptomatic. The incipient lesions on teeth indicate the presymptomatic, reversible stage in the progression of dental caries. Ideally, it is in this stage that screening should identify the risk of dental caries; however, in practice, dental screening is reduced to identifying clinical cavitation on the tooth, which most of the times is very obvious to the individual. A qualitative study by Preston et al. documented that many parents acknowledged dental health and the need to visit a dentist on being prompted by screening, as a low priority in the day-to-day lives of families with young children. Dental screening program is an expensive affair to fund. In 1992, 3.2 million children were screened in schools at an estimated cost of 2.5 million pounds in the United Kingdom. School dental screening has enjoyed tremendous political support in many countries around the world. It is considered as a key dental public health intervention. Unfortunately, the benefits of oral screening remain ill-defined. For dental screening programs to be sustainable, its effectiveness must be proven. Several studies have been conducted to assess its effectiveness in improving the dental attendance rate yielding contrasting evidence. Given the lack of consensus in the scientific community and the public (parent community and school authorities) alike, the objective of this systematic review was to determine the true effectiveness of dental screening on dental service utilization. We designed this review to understand the differences in dental attendance rates of children below 15 years of age, receiving a school-based dental screening versus those not receiving it. Weincluded randomized control trials (RCTs) comparing the effectiveness of screening with no screening, irrespective of the year of publication. Studies in English language were alone included. The participants were school children less than 15 years of age. The presence or absence of oral diseases was not a criterion in study selection. No restrictions were placed on the duration of the trial. The intervention group received dental screening and was compared to a group of children who did not receive any screening. Studies that included a health education, referral cards, or letters to parent along with screening were also included in this review. This was followed by a comprehensive manual search of the references cited in the retrieved articles for additional studies. 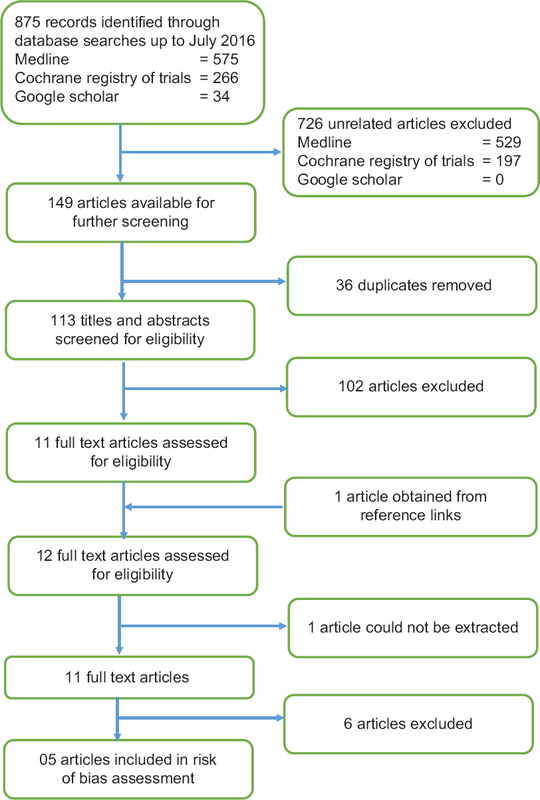 We searched MEDLINE, Cochrane Library, and Google Scholar databases for relevant RCTs to 2016. PubMed was searched with the following search strategy: Effect AND dental screening (08); “dental screening” (12); “school dental screening” (05); ((“oral screening) AND children) (00); ((“oral screening”) AND school) (01); “dental check-up” (03); (Effect*) AND “school dental services” (02); “school dental services” (03); and “dental screening” AND children (10). No limits were implemented in our search queries. This review was undertaken in 2016. Two authors independently reviewed all the titles and thereafter the abstracts for this review. If the study did not meet the inclusion criteria of this review, it was considered as discarded. There was no disagreement between the authors in the selection of studies. Two review authors independently assessed risk of bias using the recommendations in the Cochrane Handbook for Systematic Reviews of Interventions. Review authors were not blinded to author and source institution. Disagreement was resolved by consensus or third-party adjudication. Piloting of data extraction was done by one of the authors, on two articles. Both the authors agreed on the design of the data extraction form. We conducted the assessment using the recommended approach for assessing risk of bias in included studies. All included studies were assessed independently and in duplicate by two review authors as a part of data extraction process. Assessment was within a study and across the studies. Numerical data extracted from the included trials were checked and entered into Review Manager (RevMan) software. Dichotomous outcome data were analyzed by calculating relative risks. Fixed-effects models were used to calculate a pooled estimate of effect. Relative risk is a ratio and does not follow a normal distribution, regardless of the sample sizes in the comparison groups. However, the natural log (Ln) of the sample risk ratio (RR) is approximately normally distributed and is used to produce the confidence interval (CI) for relative risk. We assessed heterogeneity by inspection of a graphical display of the estimated treatment effects from the trials along with their 95% CI and by Cochrane's test for heterogeneity undertaken before each meta-analysis. Subgroup analysis was undertaken for assessments based on ethnicity, gender of the participant, and the age of the patient. A GRADE approach was used to interpret findings. A “Summary of findings” table was developed for the primary outcomes of this review using GRADE Profiler software (version 3.6). These tables provide information concerning the overall quality of the evidence from the trials; the magnitude of the effect of the interventions was examined. The outcome selected was dental attendance rate. The flow diagram describing the search results is provided [Figure 1]. Two authors independently reviewed all the titles and thereafter the abstracts for this review. Preliminary search was through PubMed and other databases such as Cochrane Library, and Google Scholar until June, 28, 2016. A total of 11 full-text articles were retrieved. A comprehensive search of the references in these retrieved articles was done manually, yielding one additional article. One of the articles could not be retrieved (a conference abstract, authors of which could not be contacted). On screening the remaining 11 articles for eligibility, 6 were further removed. An eligibility criterion was met by the final five articles. The study characteristics of the included study are summarized in [Table 1]. All the trials included in this review were clustered RCTs. Two studies were clustered based on the geographical areas., One study was clustered based on the school size and the mean decayed, missing, filled teeth of the schools, and two other studies were clustered based on social deprivation., All the trials were parallel arm design, of which two trials had third arm. The sample sizes ranged from 600 to 13,570. All the studies were conducted in a school-based setting. The study participants were children attending school from ages 5.5 to 15 years across the studies. [Figure 2] shows the risk of bias across the studies and within studies. Risk of bias assessment of the included studies was indicative of high risk. Three of the trials included in this review were unbiased for all domains. The trial by Donaldson and Kinirons was at a high risk of bias with regard to one domain (attrition bias) and unclear risk with regard to two domains (selection bias and detection bias). While the trial by Cunningham et al. had unclear risk of bias in one domain (selection bias). Assessment of risk of bias within studies showed all the trials to have a low risk of bias with regard to random sequence generation and allocation concealment (selection bias). This was with the exception of the trial by Donaldson and Kinirons and Cunningham et al., where lack of clarity was found with regard to selection bias (no mention of allocation concealment). The nature of intervention in such trials does not allow the blinding of participants (performance bias). We classified all the studies at low risk of performance bias, as this was irrelevant and unlikely to affect the outcome measure. Detection bias was found to be low in all trials with an exception of Donaldson and Kinirons. Unlike other studies, the outcome was being assessed by a questionnaire administered by the investigator; there was lack of clarity if the personnel providing the intervention were the same as those assessing the outcome measure. Similarly, attrition bias was low for all trials except Donaldson and Kinirons where high risk was detected due to attrition (drop outs, n = 316). Reporting bias and other biases were found to be low for all the studies uniformly. About 33% of the studies showed unclear bias for selection bias from lack of allocation concealment. About 20% of the studies showed unclear risk for detection bias and 20% showed high risk for attrition bias. The summary of findings is provided in [Table 2]. The pooled estimate of the included five studies favored screening marginally [RR 1.16 (95% CI 1.11–1.21)]. The review concludes that school-based dental screening increases dental attendance at dental healthcare facility by 16% when compared with a nonscreening group. It may be concluded that for every thousand persons screened, 40 more children will visit a healthcare facility than a nonscreening group. The range of CIs was narrow (1.11–1.21) and favoring screening. There was substantial heterogeneity (Chi-square = 137.26, df = 4, P < 0.0001, I2 = 97%). The letter-only intervention (a letter informing the importance of oral health or encouraging parents to examine a child's teeth and seek necessary care) was compared with the nonscreening group. Two studies, were included for the meta-analysis which showed no significant effect in the letter-only group [RR 0.97 (95% CI 0.92–1.02)]. The heterogeneity reduced from 97% to 65% (Chi-square = 2.86, df = 1, P < 0.09, I2 = 65%). The letter-only intervention was also compared with the traditional screening group. Two studies, were included for the meta-analysis. The results were indicative of marginal improvement in dental attendance in the traditional screening group [RR 1.10 (95% CI 1.05–1.16)]. There was heterogeneity [Chi-square = 13.56, df = 1, P < 0.0002, I2 = 93%]. Studies by Cunningham et al., Donaldson and Kinirons, and Milsom et al. were included in the meta-analysis which concluded that there was only a marginal effect from screening in Caucasian population [RR 1.09 (95% CI 1.05–1.14)]; Chi-square = 16.96, df = 2 (P = 0.0002), I2 = 88%. The effect estimates and forest plots of the meta-analysis and subgroup analysis are provided in [Figure 3]. Our review included five RCTs covering a population of 28,208 children, of which 21,447 were eligible for outcome measurement of dental attendance in the meta-analysis. The review concludes that school-based dental screening increases dental attendance at healthcare facility by 16% when compared with no screening at all. That means, for every thousand persons screened, 40 more children will visit a healthcare facility than a nonscreening group. Risk of bias assessment of the included studies was indicative of high risk. The quality of evidence was found to be low. There was considerable unexplained heterogeneity in the meta-analysis of the primary outcome. Furthermore, it can be stated that these studies exhibited high clinical heterogeneity (I2 = 97%) which remained unexplained. Since we used the fixed effects model, it was assumed that there is no heterogeneity between studies, and the heterogeneity within study is due to sampling error as the only source of the variance. We found the CIs of each of the individual studies overlapping; hence, this variability can be attributed to the uncertainty around each study point estimate. Of the five studies, only one study was at high risk due to attrition bias. Since the objective was to estimate dental attendance following screening and the outcome estimate in all the studies was uniformly the rate of dental attendance, it was clearly a direct measure. Of five, four studies had overlapping CIs and the point estimates of four studies favored screening, thereby attributing to the precision in the pooled value. Publication bias could not be detected due to smaller number of studies. The quality of evidence was found to be low due to high risk of bias and due to clinical heterogeneity in terms of inconsistencies. We carried out the subgroup analysis to investigate the heterogeneity among studies. Subgroup analysis on the population type suggested that Indian population was seeking dental care following screening better, than the Caucasian population. Lack of affordable and accessible dental care in India could be the reason for improved response to screening which may have been the only means to seek long pending dental care and avail treatment free of cost. In India, screening is done predominantly by the nongovernmental institutions and is not a mandatory process. Generally carried out by teaching institutions, the process of screening carries much lesser social accountability. In the given scenario, it may be believed that the opportunity to get screened and avail necessary treatment may be used well. However, in the United Kingdom and other countries, the presence of mandatory school dental screening with provision of oral healthcare has been less effective in improving dental attendance. We also tried to compare the types of interventions. We compared the intervention effects with letter-only to no screening and found no significant effect on dental attendance rates. However, we observed that traditional screening was marginally better than letter-only intervention. The review by Joury et al. differed from the current review in the assessment of quality of evidence. Unlike the previous review, we did not find performance bias in any of the studies to be of high risk. It is not possible to blind the participants in such trials; neither is it relevant. In our assessment, the lack of blinding of personnel and participant was unlikely to affect the outcome. We found the indirectness of evidence to be low as the objective and primary outcome measure (effectiveness of dental screening on dental attendance and dental attendance, respectively) in this review were the same. Here we differ from the previous review done, which downgraded its evidence on the account of dental attendance being a surrogate measure. The most significant difference is that our review defined the intervention as the presence of screening, where screening refers to a minimum of a visual inspection of the child's oral cavity. We did not include interventions such as letters and dental information leaflet sent home (Cunningham et al. and Milsom et al., respectively) in the absence of screening in our meta-analysis. These were separately assessed in subgroup analysis. The previous review has included both these interventions in their experimental group totals, despite it not fitting the criteria of true screening. These measures may be called “propaganda” rather than a screening strategy per se. This resulted in the pooled value nearing the null. We believe that our pooled estimate is more specific to the true definition of screening and provides an unprejudiced estimation. Attempts have to be made to address biases observed in previous studies through improved methodology to ensure greater quality of evidence. While most of the trials have attempted changing the screening strategies, a probe into the reasons for limited utilisation of dental services despite the knowledge of an existing disease is the need of the hour. Presently, a child is screened positive on detecting cavitation on the tooth surface. In true terms, screening must be able to detect incipient lesion in its reversible, presymptomatic state. It is recommended for trials to redesign the screening process to ensure effectiveness. This should be alongside an economic evaluation of the process, by means of a cost–benefit analysis. Trials assessing the dental diseases at asymptomatic stages with low risk of bias in different populations are mandated for strengthening future evidence. Screening is the embodiment of preventive programs. The process of school dental screening has been criticized because of unstructured referral criteria, ill-defined screening methods, lack of standardization, and lack of follow-up of children being screened positive. However, it cannot be ignored that a section of the society values it and believes there is worth in the process. It classifies as an essential public health intervention that has metamorphosed, many a times, to garner public acceptance. We believe that screening programs have limited merit when it comes to improving the care-seeking behavior in a population. Nonetheless, dental screening has so far not reported any potential harm. We also found the exercise beneficial in the developing countries or in deprived conditions where it may be the only means of seeking dental care. It must be ensured that the process is not mechanized, increasing the health gap by catering to those with better health determinants, while vulnerable people remain untouched by the program. In the presence of high risk of bias and low quality of evidence, the pooled estimates need to be used cautiously. The nonresponse of several authors made it difficult to assess the reasons for the established risk. We could not perform meta-regression, sensitivity analysis or detect the publication bias due to the small number of studies. There has been little scientific evaluation of the process of school dental inspection. With this review, we conclude that there is an evidence of marginal increase in dental attendance by 16% among those receiving screening. Since the quality of evidence is low, these results must be used cautiously. As of now, the evidence marginally favors screening, which may be due to profound variations in the populations across studies. The newer techniques or surrogates for screening have no effect on dental attendance. We recommend that school-based screening needs to pick up a case at the asymptomatic stage to gain the lead time bias which truly defines screening and may improve dental attendance in future. On the basis of these results, it can be concluded that there is no existing high-quality evidence to support or refute the practice of dental screening. Furthermore, studies were clinically heterogeneous which restricted between study comparison and limited generalizability. The Challenge of Oral Disease – A Call for Global Action. The Oral Health Atlas. 2nd ed. Geneva: FDI World Dental Federation; 2015. Peterson PE. The World Oral Health Report 2003. WHO/NMH/NPH/ORH/03.2. Geneva: WHO; 2003. Morgan M, Benett H. Dental Health Screening - An Overview of the Literature. Welsh Oral Health Unit 2013. Janakiram C, Taha F. Ethics of dental health screening. Indian J Med Ethics 2016;1:171-6. Preston ST, Davies GM, Craven R. An investigation of parents' attitudes to dental health and school dental screening. Community Dent Health 2001;18:105-9. Tickle M, Milsom K. Oral screening: Time for a change of terminology and methodology. J Med Screen 1999;6:163-4. Milsom KM, Tickle M, Blinkhorn AS. Is school dental screening a political or a scientific intervention? J Dent Res 2008;87:896-9. Higgins JP, Green S. Cochrane Handbook for Systematic Review of Interventions. England: The Cochrane Collaboration; 2011. Available from: http://www.handbook.cochrane.org. [Last accessed on 2017 Mar 16]. Informatics and Knowledge Management Department. RevMan. Available from: http://www.tech.cochrane.org/revmen. [Last accessed on 2017 Mar 16]. Grade Profiler. Available from: http://www.gradeprofiler.software.informer.com/3.6/. [Last accessed on 2017 Mar 16]. Hebbal M, Nagarajappa R. Does school-based dental screening for children increase follow-up treatment at dental school clinics? J Dent Educ 2005;69:382-6. Praveen G, Anjum MS, Reddy PP, Monica M, Rao KY, Zabirunnisa Begum M. Effectiveness of school dental screening on stimulating dental attendance rates in Vikarabad town: A randomized controlled trial. J Indian Assoc Public Health Dent 2014;12:70-3. Cunningham CJ, Elton R, Topping GV. A randomised control trial of the effectiveness of personalised letters sent subsequent to school dental inspections in increasing registration in unregistered children. BMC Oral Health 2009;9:8. Donaldson M, Kinirons M. Effectiveness of the school dental screening programme in stimulating dental attendance for children in need of treatment in Northern Ireland. Community Dent Oral Epidemiol 2001;29:143-9. Gøtzsche PC, Jørgensen KJ. Screening for breast cancer with mammography. Cochrane Database Syst Rev 2013;6: CD001877. doi: 10.1002/14651858. Milsom K, Blinkhorn A, Worthington H, Threlfall A, Buchanan K, Kearney-Mitchell P, et al. The effectiveness of school dental screening: A cluster-randomized control trial. J Dent Res 2006;85:924-8. 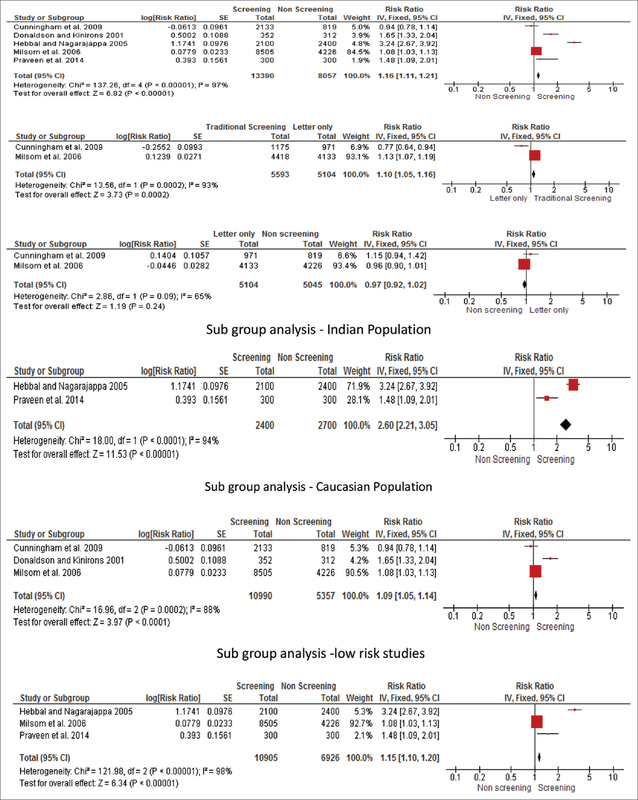 Joury E, Bernabe E, Sabbah W, Nakhleh K, Gurusamy K. Systematic review and meta-analysis of randomised controlled trials on the effectiveness of school-based dental screening versus no screening on improving oral health in children. J Dent 2017;58:1-10. Mander C. Research summary: Dental screening of school children. Br Dent J 2006;200:673. Milsom K, Tickle M, Jenner A, Moulding G. The identification of agreed criteria for referral following the dental inspection of children in the school setting. Br Dent J 1999;186:37-40.